Thanks a lot and have a wonderful 2016, hopefully with lots of the same brilliant Elliott analysis and educational material. Thanks Wieb. Have a great & profitable New Year as well! And thanks very much for the support. Once again, Joe, awesome information that we can utilize and put to our own use instead of relying on others. Thanks for all you do! This is a great post. I'll try this out stat. This is absolutely enlightening, Joe! Adding this post to my library on EW. With your expertise, you should definitely write a book on the subject. 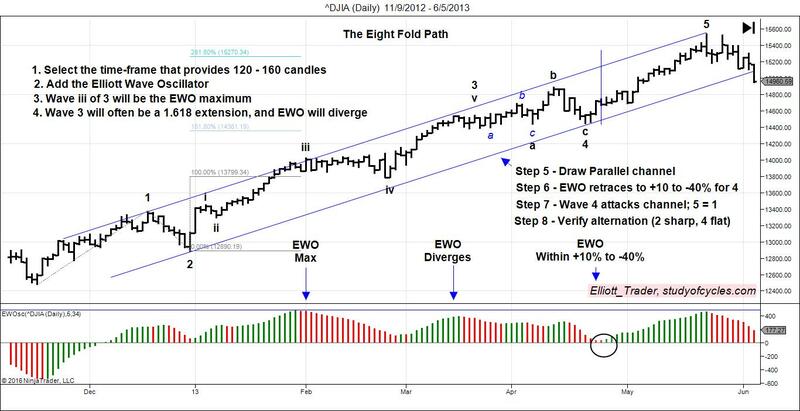 My wave4 zigzag-X-triangle "count" on SPX was busted yesterday per your correct odds assessment. Hi Could you please explain this statement better? "Computer studies have shown that most wave four's will have the EWO retrace to +10% - to -40% of the maximum value of the EWO in Step 3"
I just have a small doubt. In a Complex correction of W-X-Y, is it must for 'Y' to form A-B-C internally? Can this 'Y' wave form 5-wave Impulse? Joe, thank you, for sharing your knowledge with us. I have a question though, if wave 1 is extended does that mean the largest value on the EWO indicator will be wave iii of wave 1, instead of wave iii of 3? Does this rule apply if we have a 5th wave extension? I have enjoyed reading your commentary, and please ignore the trolls. Hello, Joe, I have another question in regards to the Eight Fold Method. 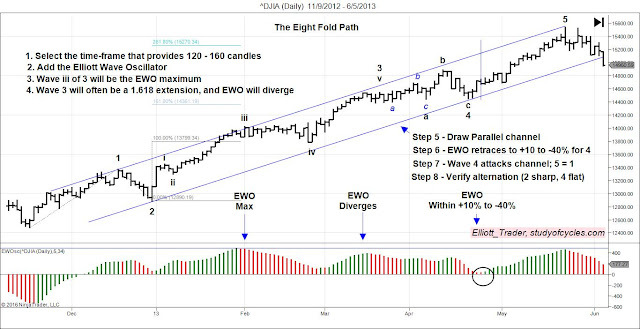 Does every impulsive wave structure have to adhere to the number of candlesticks mentioned by you? Sometimes, I have noticed on a lower time frame such as the hour, that the amount of candles to finish the wave is 300-400. Please carry on with your commentary, I have learned quite a number of things from you. Thank you.